The seven residential complexes have been arranged into a standalone league where they will compete in a variety of team sports leagues as well as standalone athletic events. Throughout the year there will be numerous events for students to attend and compete in to support their residential community. Some of these events include Fresh Check Day, Late Night Breakfast, and Faculty Appreciation. There are several athletics events designated as "Hall Cup Nights" where we encourage all residential students to attend. These tend to be televised games, and during commercial breaks, mini competitions are held where the residential communities can compete against one another. In order to partner more intentionally with already existing leadership and community development opportunities, we collaborate throughout the year with the Resident Student Association, National Residence Hall Honorary, and the complex specific Hall Councils to sponsor events and co-program for the Hall Cup. We want to know what you’ve been thinking about your experience living on campus! The information you provide helps us make living on campus better for all future Huskies and those continuing to live with us. You’ll receive a link to complete the FYE/LLC survey in your Huskymail account. Be on the lookout! For each completed survey, you earn your community five points, and the community with the highest percentage of completion gets an additional 150 points! Similar to the Hall Cup Kick-Off in September, all communities are invited to participate in a series of competitions that will earn your community points, will earn you prizes, and will provide a great way to wrap up the year for everyone involved! Come join us on the Speare Whiffleball Field from 12-2 p.m.! A campus staple, this late night food frenzy takes place in Stetson East from 9-11 p.m. Enjoy the dining hall like you never have before, and while you’re at it submit a reflection of your first year at Northeastern. For each submission, you earn five points for your community! 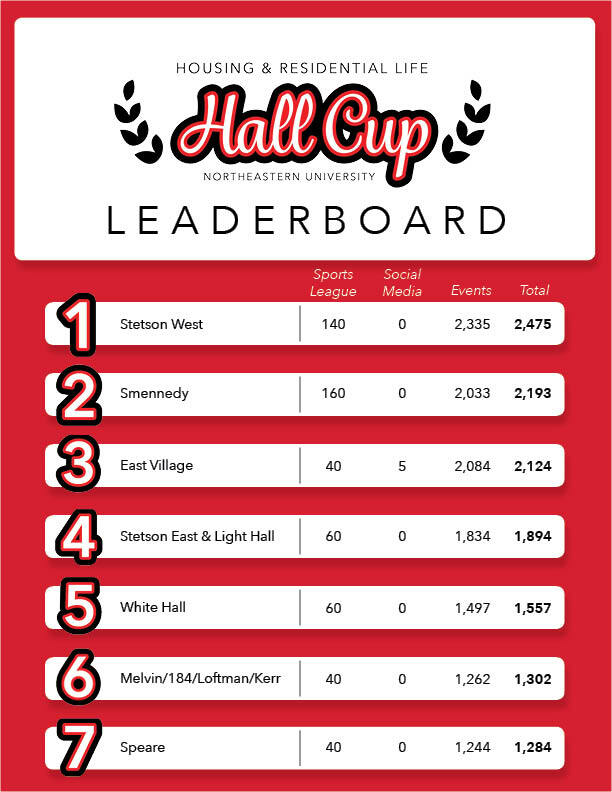 Below, find a detailed breakdown of each community’s learning communities, buildings, earned points, as well as an image gallery of residents participating in Hall Cup events!